Organization name, Logo and other attributes like that can be sent on SAML also, not sure if it’s useful just yet but might allow for some interesting uses during authentication federation. I think we should clarify “foundingDate”, do we want a year or a exact date (YYYY-MM-DD)? See: foundingDate, a JSON-LD property, so it’s already defined as a date value in ISO 8601 date format. Same goes for dateCreated and dateModified. homeUrl should be simply url (a property of Organization). logoUrl should be logo. languages should be a repetition of availableLanguage (? )… Other fields are not present in schema.org and it’s not entirely clear to me how to represent specific URLs that are not defined for an Organization, does that mean we should create a libreho.st JSON-LD schema to represent a LibreHoster, @pierreozoux? Without mentioning meta object to insert an arbitrary JSON object for future extensions and local additions. @how yes this is messy at the moment. I try to get involved on the schemaorg github repo to try to better understand. I noticed that @kate put the JSON file for WebArchitects.Coop at /librehost-api/librehost.json instead of /librehost.json. If this is OK, then we should modify the documentation and eventually come up with a /.well-known/ solution to dereference the URL to the right file. IMO it’s overkill and we should stick to /librehost.json unless there’s a good reason not to. Im not sure it matters as long as the right url is in the directory. Its probably only for discovery that it would be an issue. See: foundingDate , a JSON-LD property, so it’s already defined as a date value in ISO 8601 date format. Same goes for dateCreated and dateModified. currently “YYYY” (it was based on the hello-matrix ‘Since’ column). Changing to “YYYY-MM-DD” is the same for me as the consumer of the json can still decide what to display. Both are ISO 8601 date format. Happily accepting feedback here and on the issue tracker. 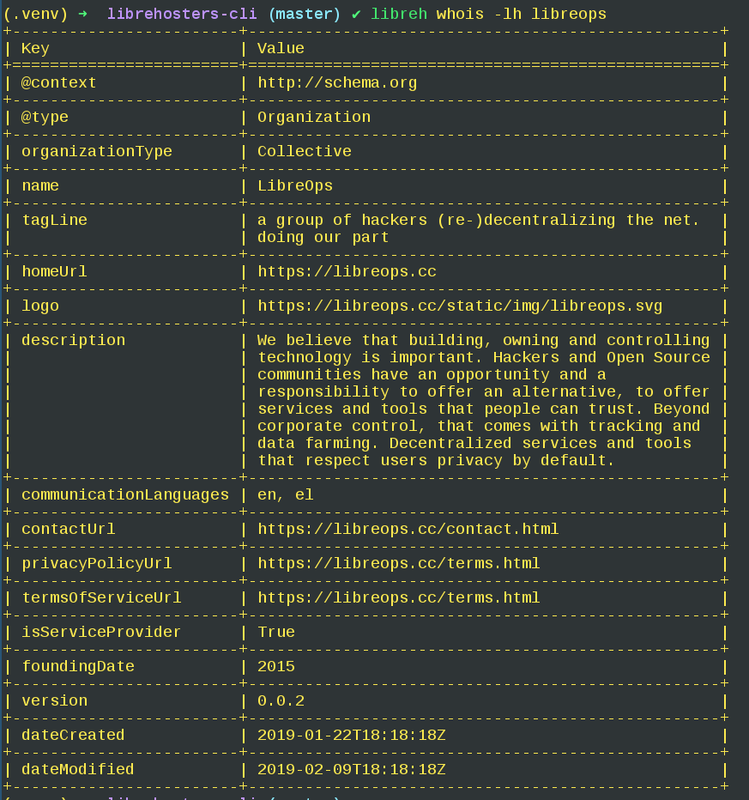 By using the tool, I discovered that both libreops.cc and linux.pizza are using a version 0.0.2 of the schema but we seem to have not updated the ‘latest’ version at https://lab.libreho.st/librehosters/librehost-api/blob/master/librehost.json (still on 0.0.1)? Is there some agreement for increasing the version number? Thank you @decentral1se for taking this up! There’s no version 0.0.2 of the schema yet. I suppose they have updated their entries and bumped the version. It’s not so clear this version is the schema version.